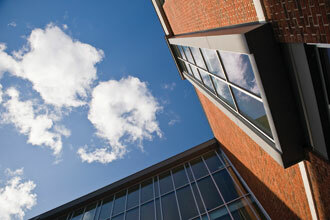 If you’ve ever wondered about the true value of social media, a class of Freeman School students has an answer for you. That’s how much a Twitter message — or, if you prefer, a tweet — the students posted on behalf of the Louisiana Museum Foundation generated for the foundation’s efforts to repair and restore music legend Fats Domino’s white Steinway piano, which was nearly destroyed by floodwaters in the wake of Hurricane Katrina. 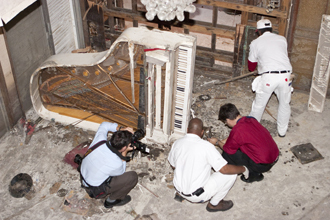 Fats Domino’s white Steinway grand piano sits on its side in his flooded 9th Ward home following Hurricane Katrina. A class of Freeman School students created a social media campaign to raise funds for the piano’s restoration and received an $18,000 donation from a fan in Australia. The Twitter project was part of professor of practice Ashley Keller Nelson’s social media communications class, which puts undergraduate business students to work on social media campaigns for local nonprofits. Last semester, the Louisiana Museum Foundation reached out to Nelson for help on a number of fundraising projects, including one to repair Domino’s waterlogged piano for the museum’s upcoming Louisiana Music Experience exhibition. Prior to the class’s involvement, the campaign had languished, with just a handful of donations that amounted to less than 25 percent of the funds needed to complete the project. To get the word out, the students created a Twitter account for the campaign, @Fats_Piano, and began tweeting about Domino and the restoration project to a growing audience of followers in the New Orleans music community. 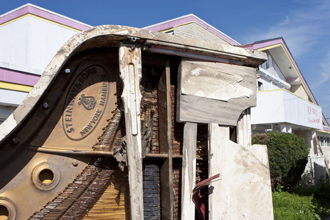 Domino’s piano, shown here in a March 2006 photo outside Domino’s 9th Ward home, is now in the hands of conservators and will be a key artifact in the Louisiana State Museum’s upcoming Louisiana Music Experience exhibition. The campaign captured the attention of some high-profile supporters, including the Tipitina’s Foundation, the Rock and Roll Hall of Fame, and even Paul McCartney, who donated $1,000 toward the restoration effort. Eventually, one of the students’ tweets found its way to a New Orleans music fan in Australia, who contacted the foundation and offered to provide the remaining funds needed to complete the project, which resulted in a donation of $18,000. Domino’s piano is now in the hands of conservators, and Maclay says she expects it to be ready for the opening of the exhibition in 2014.